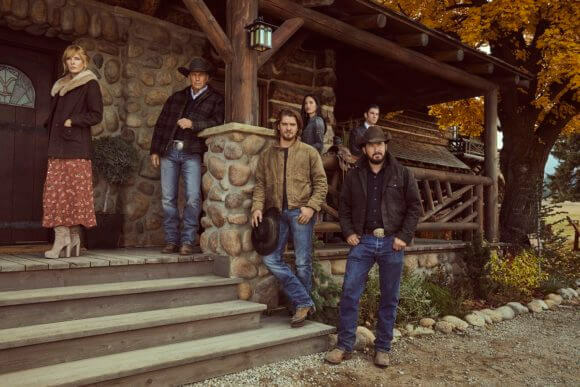 Paramount Network has set a June 19, 2019 premiere date for the second season of Yellowstone and they’ve released the first official photo from the upcoming season. The series will air new season two episodes on Wednesdays at 10pm ET/PT. Season one of the drama attracted an average of 5.1 million viewers per episode, making it the most watched new cable series of 2018. Cast members returning for the show’s second season include Kevin Costner as John Dutton, Luke Grimes as Kayce Dutton, Kelly Reilly as Beth Dutton, Wes Bentley as Jamie Dutton, Cole Hauser as Rip Wheeler, Kelsey Asbille as Monica Dutton, Brecken Merrill as Tate Dutton, Jefferson White as Jimmy Hurdstrom, and Gil Birmingham as Thomas Rainwater. The series was created by Oscar nominee Taylor Sheridan (Hell or High Water) and John Linson. Oscar-winner Kevin Costner (Dances with Wolves) executive produces Yellowstone along with Sheridan, John Linson, Art Linson, and David C. Glasser. The one-hour drama is produced by Paramount Network and 101 Studios.